Although for some of the earlier boxes in this series the works included more or less chose themselves - the Symphonies and the best known Concertos in Volume 1 and the two Oratorios and some songs in Volume 3 for instance - that cannot have been the case here. Mendelssohn wrote large quantities of chamber music and music for keyboard so that including a representative selection is a more complex task. What we have here is essentially a single disc to represent the organ music, a disc of the two Piano Trios, a disc of early works including the Octet, and the whole of the piano Songs without Words on two discs. It is the last of these that may cause most surprise. 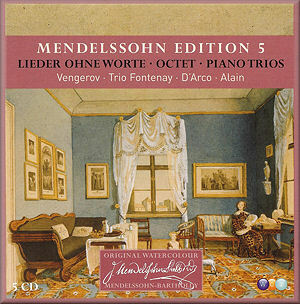 It would certainly have given a fuller picture of Mendelssohn as composer to have had just one disc of the Songs without Words and to have used the final disc for some of the String Quartets, a crucial part of the composer’s output. Despite this, what we have does fairly represent just how wide the composer’s scope was and above all his imagination in providing music for different kinds of instrument and circumstance. The two discs of Songs without Words include all forty-eight of those for piano published in Mendelssohn’s lifetime but excludes those for other instruments and those published posthumously. They used to be found in bound copies in every piano stool but today are found more often in secondhand shops. At first sight the choice of a recording of these pieces almost fifty years old may seem eccentric but the actual recording quality is far from bad and certainly does not get in the way of enjoyment. The performances themselves are well worth hearing. Annie d’Arco is perhaps not the starriest name from Warner’s back catalogue, but she plays with a delightfully unaffected simplicity and honesty which suits this music admirably. It is best not to listen to too many at a time as that does emphasise their similarities and limited range, but taken a set at a time they are utterly delightful. I frequently found that I was being transported to the kind of small salon or domestic circumstances under which this music was originally played, but with a pianist far better than one would expect to encounter there. The single disc of organ works is also well chosen in terms of works and performances. All of the Preludes and Fugues, the best of the Sonatas and a single example of the shorter works make for a very good representation of this part of the composer’s output. Enjoyment is guaranteed in Marie-Claire Alain’s performances on the organ of the Church of St Benedict in Ringsted, Denmark. She plays very stylishly and excitingly - not a phrase one often uses about performances of Mendelssohn’s organ music. Similar comments can be made about the Piano Trios. These had to form an essential part of any box devoted to Mendelssohn’s chamber music, and the Trio Fontenay play them to perfection with great clarity and finesse, as well as an appreciation of their darker qualities. The final disc contains one admirable performance - the Octet, one of real class that by itself would justify the disc - the Sonata, and the early D minor Violin Concerto which is not only a dull work but receives a suitably dull performance. It is nonetheless only a small part of this delightful set, which would be worth having even if you have these works in other performances already. With so many alternative performances and works to choose from for this set the choices must have been difficult, but despite the lack of any of the string quartets they have been made very well here, and the result is a very enjoyable and worthwhile set.